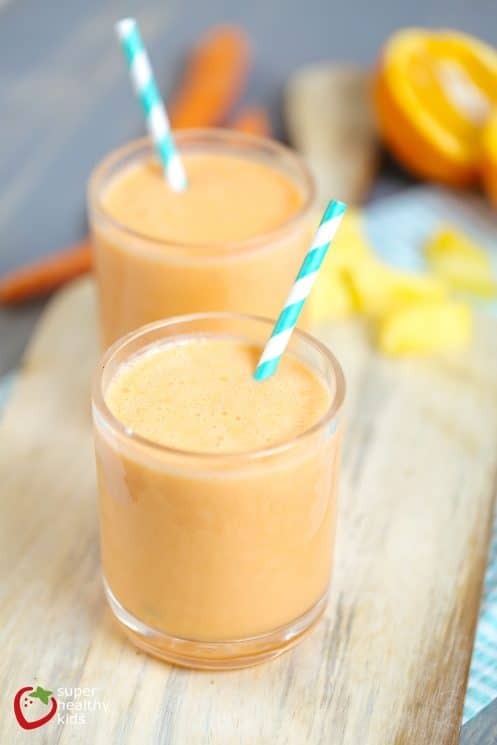 The deep orange/gold color of this smoothie says it all! Its a great source of Vitamin A and a great way to get some carrots! 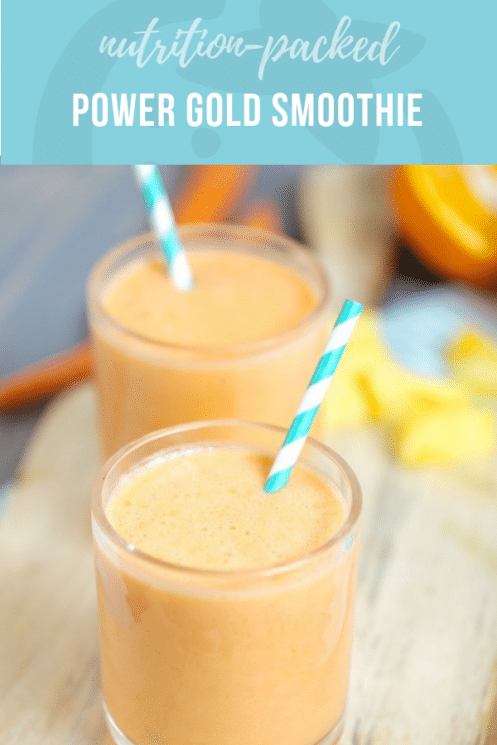 Our Power Gold Smoothie Recipe gets a gold medal for a breakfast smoothie because it will provide your kids not only with Vitamin A, but lots of antioxidant power with Vitamin C, B6, Magnesium, and fiber! 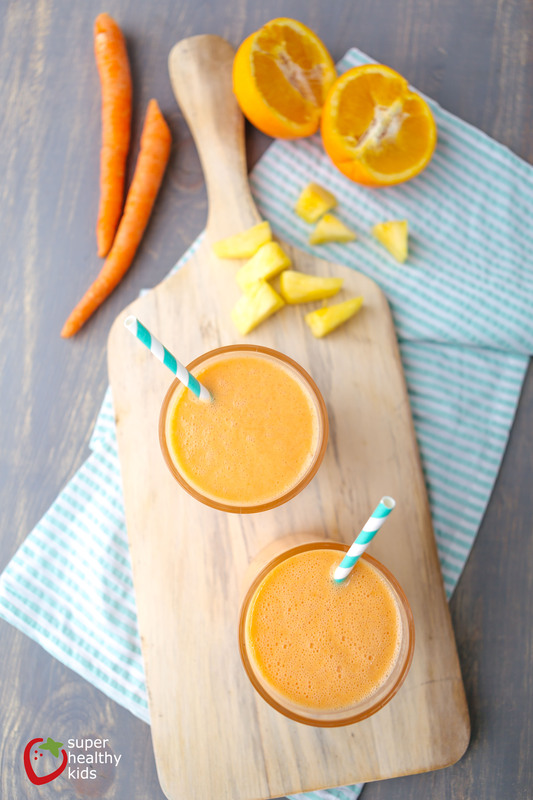 The key to making this smoothie delicious is to first softened the carrots just a bit. Steam them just until soft – this helps make them really smooth. You can add them raw if you have a high powered blender and really puree them good. You will want to really puree the carrots for until they are very smooth. Use some of the pineapple juice to make it smooth. Then finish with the rest of the ingredients. Blend until smooth and frothy. Serve it up with a fun straw and your kids will be off to a great start for the day! We love smoothies for breakfast because sometimes it is hard for my kids to eat very much in the morning before they go to school. They will always sip on a smoothie though and I love how much nutrition you can pack in to one small glass. 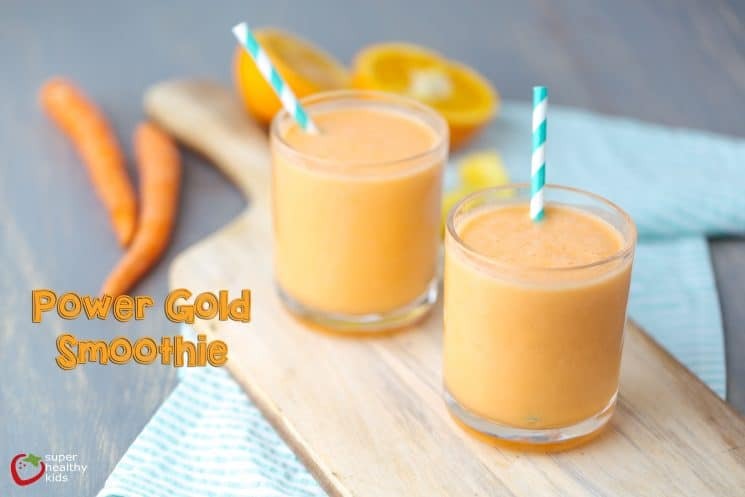 This smoothie is kind of our version of an orange julius, but much healthier! It is super sweet because pineapple and carrots have a natural sweetness. 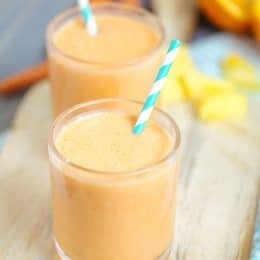 The orange makes it really fresh and definitely a smoothie your entire family with love! 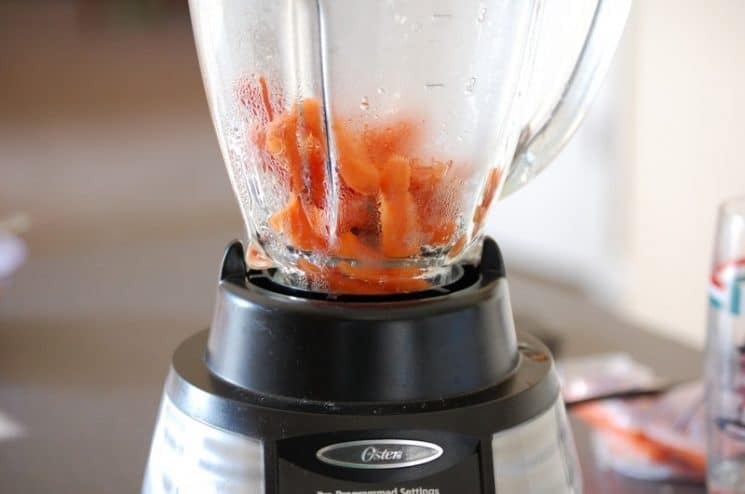 Steam carrots if not using a high powered blender. 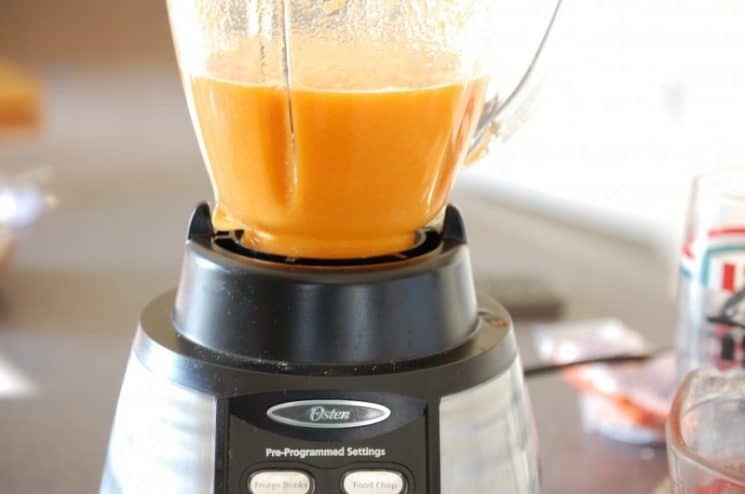 Blend carrots with pineapple juice until smooth. Add the rest of the ingredients to your blender and blend until frothy and smooth. Way to be wild and crazy!! I don’t think I could stay awake through a midnight movie anymore! 🙂 And to think I used to call myself a night owl. Hope you have a great birthday tomorrow! does it taste “carroty”? And could you use fresh pineapple instead of juice or would it be too chunky? Happy Birthday and I can’t believe you went to a midnight movie! HaPpY BirThdAy!!! And how was New Moon? Way to stay young, it’s good for the health! Happy Birthday!! Do you splurge and have birthday cake or any other kind of treat on your special day? Great smoothie idea! I just got a call from the library that my first reserved Dr. Fuhrman book is in! It’s the one you mentioned yesterday…disease proofing your child or whatever. I can’t wait! Skinny B was good and made me laugh really hard! I got some good recipes out of the cookbook companion! Liz, that was the latest I’ve stayed out in over 20 years!! Eleice, I didn’t think it was carroty at all. A little pulpy though. Heather: It was fun. I thought it was way better than Twilight (but I didn’t love Twilight so it wasn’t hard to beat) Very disturbing when Edward took off his shirt. He should NOT take off his shirt. Jacob on the other hand can leave his shirt off all day! Well, he is only 17 so I shouldn’t say such things. Stacey:I definitely splurge. But since I’m the only one in my family who likes making cake, no one ever makes it for me. But I love to visit a good bakery! I’m excited for you to read that book! I hope you got to sleep in! I didn’t make it to bed till 4 and I had to get Graham up at 7. Apparently I don’t function well on 3hrs. sleep. The same girl already rented the theatre again for Eclipse in June. Are you in????? HAPPY BIRTHDAY AMY, so glad you went out with friends and stayed up super late. I haven’t stayed up that late in years, even to scrapbook. I like the tips on just changing one meal at a time. The menu looks great to start off summer vacation. Hope you had a wonderful and fun birthday/weekend. Amy I’m thinking of trying this smoothie since I finally have a good blender. I am a little afraid of the carrot taste. But I’m hoping the pineapple and OJ cover it up. My 9-year old daughter LOVES Power Gold Smoothies!!! I made this today, and it turned out awful! I did a couple things that could have been “wrong.” I forgot to puree the carrot first, so maybe left it a bit chunky? And I added 1/4 cup of frozen pineapple instead of ice because I didn’t want ice chunks in my smoothie. Maybe the pineapple curdled the yogurt? I don’t know. It was chunky like applesauce. I ran it through a strainer and saved some of the juice… Then, I added vanilla ice cream! lol Totally defeated the idea of a healthy smoothie, but my kids wouldn’t have touched it the way it was. It ended up tasting a bit like a dreamsicle! I would be curious if others made this and had better luck. If I try again, I will not add frozen pineapple chunks, and I will remember to puree the carrots first. Oh no!! Christy, this one is actually one of our favorites. It probably does help if the carrots are super smooth and pureed first. Really tasty, but small serving size.